It's May already but the heat is still insane! How's your summer so far? Mine or rather our's is awesome. So far had three beach trips since summer started last March. Aside from hitting the beach, taking on long road trips with family and friends is one of the best ways to spend summer. With the summer’s heat, also make sure you and your car are covered. 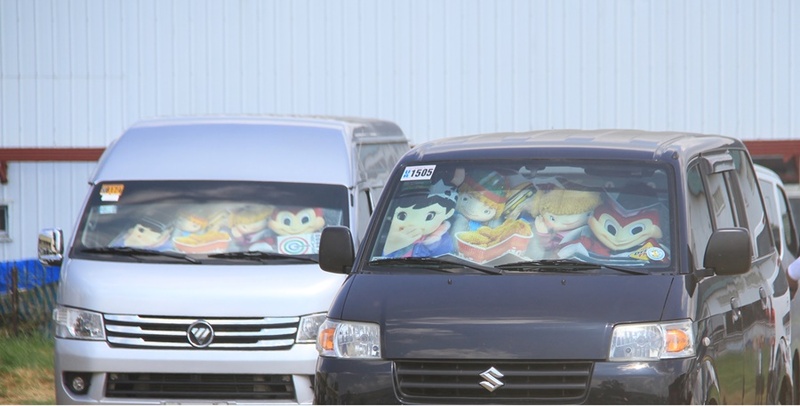 Catch Jollibee, Hetty, Twirlie, Yum and Popo as they help keep your vehicle cool with the new Jollibee car shade. Save your interiors from the sun’s UV rays and make your road trips much more fun for your loved ones. Having the most number of drive thru stores in the country, Jollibee brings your favorite on-the-go offerings in the most convenient way.For every P100 purchase in any of the 252 drive thru stores, simply add P199 to avail. This cool and fun car windshield accessory is available until May 31 only. Go get yours now and make your car the joy in any parking lot!